March 23, 2011 - Sustainable Oils, a producer of renewable, low carbon and domestically made fuels, announced jet fuel derived from its camelina powered the successful test flight of a U.S. Air Force F-22 Raptor aircraft. The aircraft was powered by a 50/50 fuel blend of conventional petroleum-based JP-8 and biofuel derived from camelina. "The F-22 flew on Friday, and performed flawlessly on the biofuel blend citing no noticeable differences from traditional JP-8," said Jeff Braun, director of the Alternative Fuels Certification Division, part of the Aeronautical Systems Center at Wright-Patterson Air Force Base, Ohio. According to the U.S. Air Force, the flight test ?consisted of air starts, operability, and performance at different speeds and altitude throughout the flight envelope. 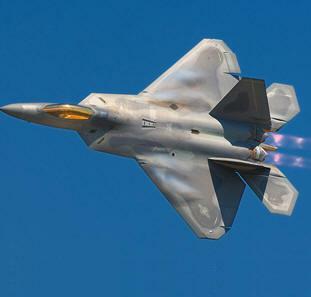 The F-22 Raptor performed several maneuvers including a supercruise at 40,000 ft. reaching speeds of 1.5 Mach. Supercruise is supersonic flight without using the engine's afterburner.? To date, Sustainable Oils has contracted for more than 500,000 gallons of camelina-based biofuel with the U.S. Air Force, Navy, and Army. Fuels derived from camelina have been the most thoroughly tested of all aviation biofuels. They have successfully powered a variety of aircraft, including commercial airlines (Continental, Japan Airlines, KLM) and multiple military aircraft (A-10 Warthog, FA-18 Hornet, and MH-60S Seahawk Helicopter). ?Camelina-based jet fuel is ready for liftoff,? said Scott Johnson, President of Sustainable Oils. ?As this most recent test demonstrates, it needs no additional research, development or technology. It actually adds to the food chain, and dramatically reduces the carbon footprint of the fuel.? Although it is a plant, camelina does not compete with crops grown for food. Rather, it grows well in rotation with wheat and on non-irrigated land. Given its high protein content and Omega 3 fatty acids, its ?meal? (what is left after oil extraction from the seed) has been approved by the USDA for livestock and poultry feed, thus adding to the food chain. A Michigan Tech University life cycle analysis (LCA) of camelina jet fuel showed that it reduces carbon emissions by 75 percent compared to petroleum jet fuel. Camelina is a genus within the flowering plant family Brassicaceae. One species, Camelina sativa, is a historic and potentially important oil plant. The US State of Montana has recently been growing more and more camelina for its potential as a biofuel and bio-lubricant. Plant scientists at the University of Idaho and other institutions study this emerging biodiesel. Studies have shown camelina-based jet fuel to reduce carbon emissions from jets by about 80%. The United States Navy chose camelina as the feedstock for their first test of aviation biofuel, and successfully operated a static F414 engine, which is the engine for the F/A-18, in October 2009 at Naval Air Station Patuxent River, Maryland. The US Air Force also began testing the fuel in its aircraft in March 2010. KLM, the Royal Dutch Airline, was the first airline in the world to operate a passenger-carrying flight using biofuel. On the 23 of November 2009 a Boeing 747 flew, carrying a limited number of passengers, with one of its four engines running on a 50:50 mix of biofuel and kerosene. Camelina has been approved as a cattle feed supplement in the US as well as an ingredient (up to 10% of the ration) in broiler chicken feed and laying hen feed. Camelina seed ranges from 37 to 41% oil content and this oil is high in omega-3 fatty acids. Camelina meal is the by-product of camelina when the oil has been extracted. Camelina meal has significant crude protein content. "Feeding camelina meal significantly increased (p < 0.01) omega-3 [fatty acid] concentration in both breast and thigh meat [of turkeys] compared to control group." Medical research indicates that a diet abundant in omega-3 fatty acids is beneficial to human health. The Lockheed Martin/Boeing F-22 Raptor is a single-seat, twin-engine fifth-generation supermaneuverable fighter aircraft that uses stealth technology. It was designed primarily as an air superiority fighter, but has additional capabilities that include ground attack, electronic warfare, and signals intelligence roles.